Arsenal forward Pierre-Emerick Aubameyang has reportedly emerged as a surprise target for Real Madrid as they seek to bolster their frontline ahead of next season. Aubameyang joined the Gunners from Borussia Dortmund in the winter of 2018 and he has since been a huge hit with 32 goals for the club across all competitions. However, according to Fichajes.net, the 29-year-old may still considering a fresh challenge away from the north London side, should Los Blancos make an approach to sign him. 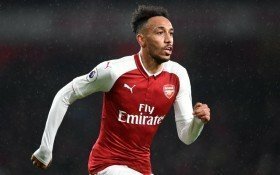 Aubameyang has publicly revealed his childhood dream of playing for the outgoing European champions in the past and reports indicate that Los Blancos could make a £39m bid for his services this summer. Despite the speculation, it would come as a surprise, if the Gunners are to consider the sale, given the marksman remains one of their most influential performers under Unai Emery. Moreover, he was prised away from Dortmund for a club-record £56m last year and the Gunners are sure to demand a significant increase on that sum to even consider the prospect of selling the striker.